Novissima et Accuratissima Helvetiae, Rhaetiae, Valesiae et Partis Sabaudiae Tabula - Danckerts, J. Title : Novissima et Accuratissima Helvetiae, Rhaetiae, Valesiae et Partis Sabaudiae Tabula. Size : 19.1 x 22.2 inches. / 48.4 x 56.4 cm. 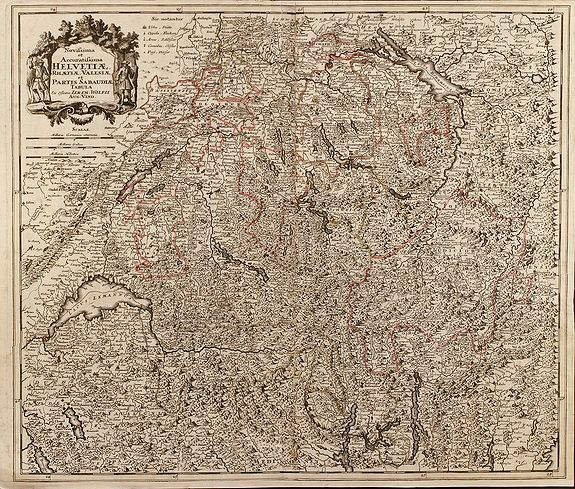 Description :Detailed map of Switzerland including South Germany with the Lake of Constance and Liechtenstein. Map from Jeremias Wolff by J. Danckerts. Condition : Centerfold professionally repaired, small margin. Good conditions.